Review: 2013-01-30, good fight between Daniel Geale and Anthony Mundine: three stars. Daniel Geale (28-1-0) entered as the No.3 middleweight in the world while Anthony Mundine (44-4-0) entered as the No.14. 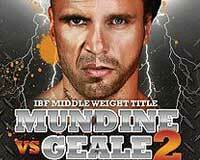 In their first fight Mundine defeated Geale by split decision and it was one of the best boxing fights of 2009; Geale vs Mundine 2 is valid for the IBF middleweight title (Geale’s fourth defense). Watch the video!